Watermelon a Great Fruit for Your Health and Running! Watermelon is good for everybody because it contains 92 % water! Watermelon strengthens the function of your stomach and spleen and is a good diuretic, because it provides you with citrulline. This amino acid helps to make more amino acid in our body, all this helps your kidneys to function better by relieving your body of its toxins! 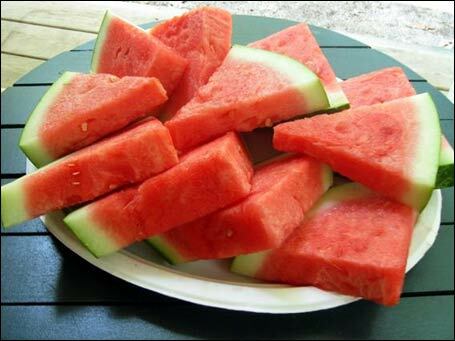 Watermelon is a rich source of vitamin C, vitamin A, vitamins B6 and B1, magnesium, thiamine, potassium and water! It is a fruit that ranks more valuable than any other fruit or vegetable on the planet. The flesh of the fruit contains the highest amount of antitoxin! It's called lycopene that gives watermelon it's bright red pigment. No other fruit has such a high content of this antitoxin! When watermelon is digested it's components travel through the body and attack free radicals that like to form diseases in your body! Free radicals hamper your body by damaging your tissues and speed up your aging! Especially in the summer there is a good chance that you perspire when you exercise. Watermelon is good for your health because when we lose valuable nutrients through sweating, watermelon puts them back efficiently! This valuable fruit is thirst quenching and tasty! Just because it contains 92% water it is a good choice of fruit to replenish fluids lost when hydration is an issue. It can be blended or juiced from cut up chunks and you can even add the seeds. The white and green parts of the rind are also excellent to add for your good health too! It doesn't have any added ingredients interrupting your thirst and health and you body knows what to do with this food because it's an all natural! Watermelon produces excellent energy for your running or walking by re-hydrating you and keeping you healthy!